Yuya is a guy that never keeps one job for longer than a few weeks. In his opinion it is boring to work and he would rather be out with friends and have fun. One day as he is on his way to an interview at a CM company he forgets his phone on the metro and so he calls it and a woman, Fujii Minami picks it up. She then tells him that she will leave it at the station so he can come and get it back later. Fujii is also on her way to work and she then realizes that the new part-timer is Yuya. So now their relationship develops and Yuya starts having feeling for Fujii even though she is older than him and has a career. He ignores his feelings because there is another guy Fujii is interested in and he instead tries to help her. But then Fujii turns the other guy down because he is still in love with another woman. So Fujii now also likes Yuya and they kinda begin dating. But then there is another girl who likes Yuya. And Fujii feels sorry for her so she also ignores Yuya for a while. And so on Yuya and Fujii want to be together but lots of people are in the way. Kinda.. Boring. I had a hard time getting through this drama. 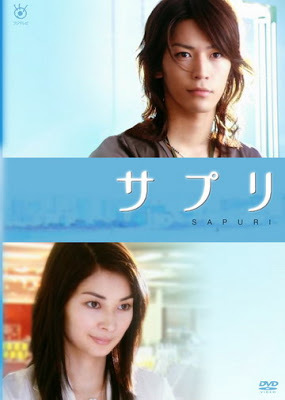 Of course again I only watched it because of a Atsui boy:P Kame. It is also my first young-boy-in-love-with-older-woman-drama. And .. I didn’t really like it. I just couldn’t picture it. Like I understand and all I mean.. its just age difference but still, somehow it just didn’t work. Other than that it was quite interesting watching how a CM is out together. But im just tired of love stories where you got like at least 5 people involved. To be honest I don't remember why I watched this drama, maybe it was the huge celeb cast? Kame, Ito Misaki, Eita, Asami Reina, Ryo and Shida Mirai to mention a few... But really, I don’t really recall any good moments in this drama. Oh, yeah Yuyas character was fun and I am an Eita fan, but the storyline didn’t do them justice. I loved the working place, and the crush Yuya has on Fuji, since it reminded me of Anego, but come on! That she actually accepts him? Doesn’t make sense! She doesn’t love him, or that was the feeling I got, and he loved her ALOT. I don’t know. The drama is not my thing.